Over 160 Yeshiva League Alumni Hockey players from schools all over the tri-state area came to compete in the 2nd Annual HASC Hockey Classic benefit Camp HASC. Camp HASC would like to emphasize the incredible job done for the second year in a row by co-chairs Gilad Rosenberg and Sam Schertz, tournament director Kivi Naiman and tournament advisor Elliot Weiselberg. The morning session featured all 12 teams in round-robin play. 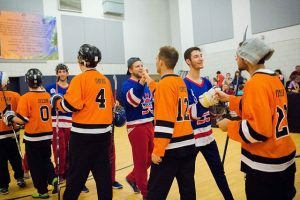 The schools were split into four groups of three, two of which played their games in TABC, while the other two went to Maayanot or Yeshivat Noam in Paramus. Each team played two games with the top two teams in each group of three advancing to the Tier I playoffs in the afternoon, while the third-place team would move to the Tier II playoffs. At each site, all players received personalized jerseys based on their school colors, complete with their name and number, sweatpants, a water bottle and drawstring bags, courtesy of LNS Enterprises. Out of the morning sessions, Frisch, HAFTR, TABC, and MTA won their respective groups, with DRS, Kushner, HANC, and Team Canada advancing to Tier I as well. For their efforts, SAR, All City, Rambam, and JEC would be heading to the Tier II bracket. After the morning games, all teams returned to TABC for lunch catered by EJ’s Place in Teaneck. In the afternoon, all games were played in Teaneck with the Tier I playoffs taking place in TABC and the Tier II tournament in Maayanot. Each team was asked to raise funds for Camp HASC. For more than 40 years, Camp HASC has served the Jewish community as the premier summer program for children and adults with special needs and intellectual and physical disabilities. In just a little over a month, through the efforts of over 150 participants, more than $96,000 was raised for this incredible program. Donations can still be made at hockey.campHASC.org. Additionally, sponsoring the event were Leeding Builders Group and Avison Young. On the courts, Frisch, TABC, HAFTR, and MTA advanced to the semifinals with both games resulting in identical 1-0 victories in overtime, setting up a familiar sight over recent years for Yeshiva League hockey fans, a showdown between MTA and TABC. The game went scoreless into the second period until TABC defenseman Donny Fuchs (TABC ’12) scored the first and only goal. Tournament MVP was Daniel Levy (TABC ’16) and Top Goalie was awarded to Mordy Dubin (TABC ’11) who shut MTA out the rest of the way, capping off a day where TABC went undefeated in their five games played on their way to the Tier I Championship. In the Tier II championship game held at Maayanot, SAR topped Rambam 4-2 behind goals from Josh Rosenberg ‘16, Seffi Jonas ’15, Michael Grossinger ’07, and the game winning goal by Solomon Freilich ‘17. Additional awards were handed out, courtesy of Crown Trophy of Brooklyn, including top defenseman, which went to Zev Markowitz (MTA ‘15), as well as four All Tournament team trophies, awarded to Jordan Gellman (HAFTR ‘09), Ari Drazin (Canada ‘09), Moshe Jaroslawicz (MTA ‘10), and Eitan Grossinger (SAR ‘12). Camp HASC would like to thank JEC, which raised the most of any team with over $11,500, as well as the top ten individual fundraisers from over 160 players: Ariel Holzer (Rambam ’98), Nachi Karpel (JEC ‘05), Sam Schertz (DRS ‘08), Eitan Gavarin (DRS ‘09), Chesky Schreier (DRS ‘10), Josh Rosenberg (SAR ‘16), Sam Schwalbe (SAR ‘15), Kevin Schrier (HANC ‘11), Akiva Gottleib (MTA ‘14), and Ian Schrier (HAFTR ‘06). Proceeds from the Camp HASC Hockey Classic will be dedicated towards providing affordable therapeutic care for the hundreds of children and adults spending their summer at Camp HASC. The range of therapeutic activities, adaptive physical therapy, bike riding, and tailor-made motorized equipment, as well as a dedicated, professional staff, enables everyone to participate and for special campers to reach goals beyond all expectations. Each summer, miracles take place in the Camp HASC therapy department, where individuals with special needs receive world-class, occupational, physical, speech, and music therapy, tailored to meet their specific needs.